To login to your attendee portal, click the blue button Login to the Portal Button in the upper left corner of the screen. 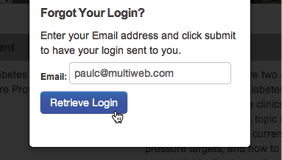 Your login will always be your email address. 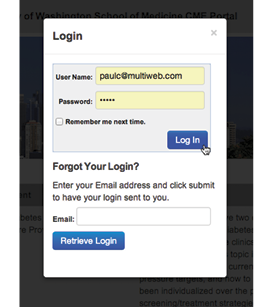 If you cannot remember your login information or password, use the “Forgot Your Login?” section of the login panel. Enter your email address and click the Retrieve Login button. If you have an account in the system using that email address, you will get an email with your account information. Be sure to check your Spam or Trash folders if you do not see the email within a few minutes. To update your demographics information, simply click the “Profile” link on the left. 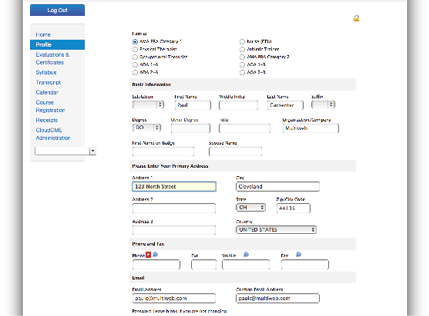 A form will load and it will preload all of the existing data for your account. 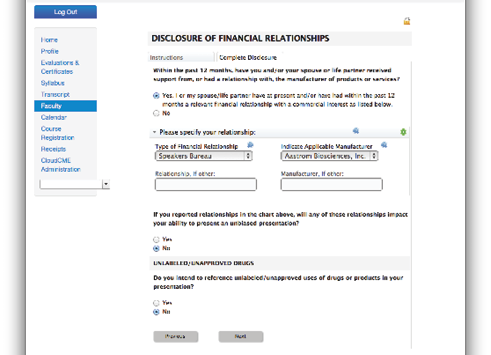 Make any changes needed and click “Submit” at the bottom of the form to save your data. You can register for events directly in the portal. From the home screen or the Course Registration button, you can view current events. Click the Details button to see more information. You can then click on the expandable bars (Overview, Registration, Faculty, etc) to hide or show more information about the event. Click a “Register” button to display the registration form for the event. If you are a faculty member, when you login you will see a “Faculty” item in the navigation. Click to view any of the tasks that you need to complete. Click a form to display it, enter your information as needed and click “Submit” once done. Completed forms show a green check-mark next to them.